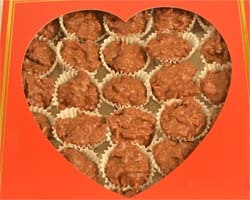 Shreds of real Sweet, tropical, toasted coconut hand-dipped in Dorothy's luscious chocolate. Coconut lovers will rave! One of our top-selling items! RedBox with Valentine heart offers clear view of the delicious items inside. Gold trimmed and elegant -- yet simple. The perfect gift for any Valentine.